I have been working nonstop on new work for Michael Murphy Gallery in Tampa. 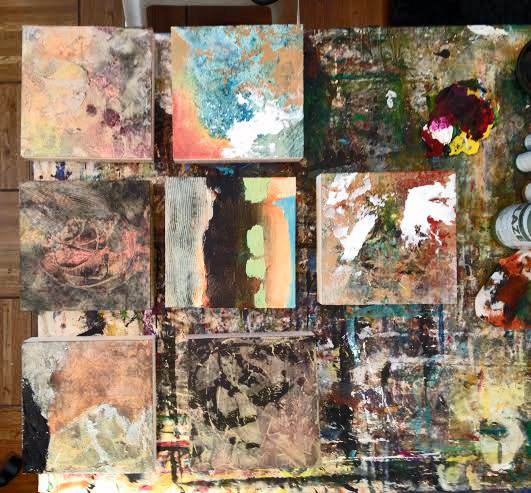 Here are the first paintings for the gallery, previously shown in progress. It’s a little hard to tell the paintings from the table cover, wouldn’t you agree? And here are the finished pieces in a grouping. I feel good about these, and have just finished another series of them, which I’ll show in subsequent posts. Each of these panels is 8 inches square and 2 inches deep. How lovely to be working in a gallery. Really like the results above. Thank you, Myfanwy! It is nice to have a good gallery. Not all of them are. I love working with Michael. A great selection of works. Good .luck with the show. Thanks, Jo! Glad you like. How deligent you have been. They look really good. Would love to see in person. Thanks, Pat. I’d love to see them again in person, but probably won’t. But it’s not all bad. I try to photograph every single one as well as possible so I can remember them. They help me with the direction of my work. I love this size! 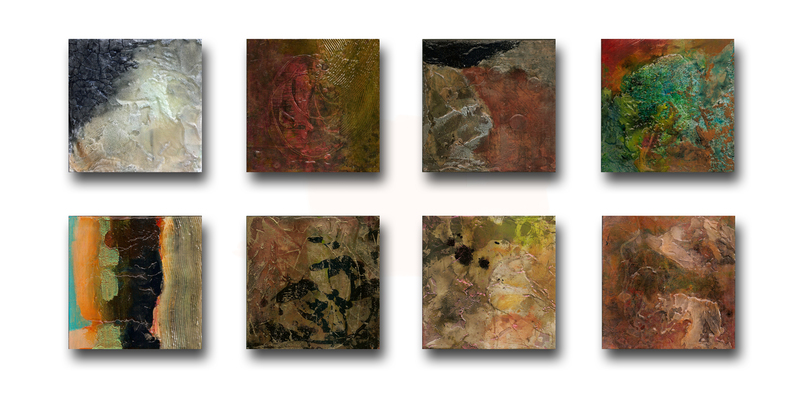 Many of my daily collages are about the same…matted they are 14″ x 14″. It is a nice format for the “essence” of a piece. These are lovely, thanks for sharing! Cindy, I absolutely love small works, no matter the substrate. On paper they are wonderful with plenty of border. Hello, Martha. For some reason I can never get a comment posted on your blog, but I wanted you to know how much I appreciate your diligence in posting. You manage to balance blurbs about painting, gardening and other parts of your life which keeps your readers I terested. This one came through just fine, Annette! Thanks for being there. And thanks for your encouragement! I love your work! Would be great to see them in person to really get the full effect, but I can clearly see you’re a very talented abstract artist.